Two men have been arrested after a teenager was killed and two others injured in a knife attack at a flat in south-east London. 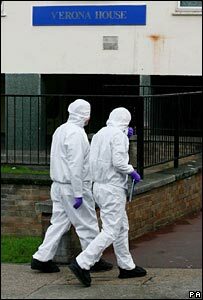 Police were called to Waterhead Close, Erith, in the early hours and found the boys, aged in their mid to late teens, suffering stab injuries. One of the victims was pronounced dead at the flat in Verona House. The others were taken to the Royal London Hospital. One youth is seriously ill, the other was discharged. A police spokesman said: "Two males, both aged in their twenties, have been arrested today in connection with the murder of a male at Verona House, Erith in the early hours. Both men are in custody at a south London police station." Officers said the victims may have been involved in an "altercation" with a suspect or suspects who left the flat after the attack. 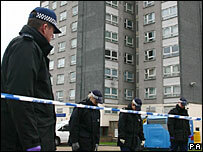 Forensic teams were combing the flat on the 15-storey tower block, one of seven on the Larner Road Estate. Local councillor David Hurt, from Bexley Council, said the estate had a reputation for crime that was unjustified. "This is not the sort of thing I would have expected from this estate and my reaction to another young person being stabbed and dying as a result is appalling as far as I am concerned. "It's another waste of a young life." However, local residents said the building was condemned and the area was known for being a "low-life area". A woman in her 20s, who lives in the area said: "It's the gangland of Erith. "That's the worst block in the whole estate. They were going to knock it down but they never did." Another resident, a man in his 20s, said there had been a number of attacks in the area. Other residents said a large gang of youths known as Rebel Assault was terrorising the area. Norman Brennan, of the Victims of Crime Trust and Knives Destroy Lives Campaign, said: "Another child's life has tragically been cut short as a result of knife crime. "Campaign after campaign has been launched by the government and other relevant bodies but it has had little or no effect on knife crime and the carrying of knives." The boy is the second London teenager to die of stab wounds this year. On New Year's Day, 17-year-old Henry Bolombi was chased by a group of youths and then stabbed in the chest in Edmonton, north London. Last year 26 teenagers were killed in stabbings and shootings in London.